The appearance of your fingernails can give clues about possible issues with your overall health. If your fingernails are discolored, have horizontal ridges, are pitted, or curve, you may have a medical condition that should be investigated by a doctor. It is also a good idea to contact your doctor if your nails curl outwards, a condition known as koilonychia or spoon nails. Why Do My Fingernails Curl? Downward curved fingernails can indicate a problem with respiratory health, and are often present in people who have medical conditions such as COPD, chronic bronchitis, asthma and lung cancer. Fingernails often curve downwards as a result of lack of oxygen. They may also be bluish or yellowish in color. If you have downward curved fingernails and trouble breathing, see your doctor. If your body is not getting the right balance of vitamins and minerals, your fingernails may curl down or become brittle or soft. It is important to check your diet to be sure that you are getting enough vitamin B-12, iron, and other healthy supplements. You can also take vitamin supplements if you are not getting enough from your diet. Your doctor may decide to check your blood in order to discover any vitamin deficiencies, and a naturopath can assist you in helping you choose which supplements may be best for you to take to ensure your body is getting what it needs. Why do my fingernails curl? It could be due to injury. If you have recently injured your fingers, you may notice that the nails on those fingers have begun to curl downward. It is a good idea to keep the affected nail(s) cut short until the part of the nail that is injured has grown out. 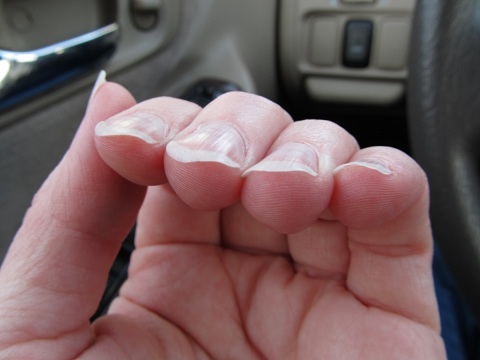 Once the injured part is grown out, your fingernails should once again grow normally. You may have curved fingernails as a result of heredity. Check to see if either of your parent’s hands have fingernails that curve downward. It they do, then that is probably why yours do, too. As long as your fingernails are healthy and straight otherwise, then there is probably no reason to worry about them. If you would like to lessen the look of the curve, keep your nails short and squared. It is a good idea to see your doctor if you notice a change taking place with your fingernails. They will be able to check you out in order to determine if there is an underlying medical reason for the change in their appearance. Changes in fingernails, hair, eyes and skin should be investigated in order to properly diagnose and treat any health issue you may have. Nail clubbing takes place over time and causes the nails to curve around the tips of the fingers and become larger. It can be caused by low blood oxygen levels and may be a symptom of lung disease. Some medical conditions associated with nail clubbing include liver disease, cardiovascular disease, inflammatory bowel disease, and AIDS. Spoon nails, also known as koilonychia, are nails that appear to be scooped out and are soft. The scooped part of the nail is often big enough to hold a drop of water. Spoon nails can be a symptom of hemochromatosis, which is a liver condition where too much iron from food is absorbed by your body. Spoon nails may also appear with people who have hypothyroidism, nail-patella syndrome, or heart disease. If you work in an environment where your nails are exposed to petroleum based solvents, you may also experience spoon nails. Now you've got the answer to: Why do my fingernails curl? the next thing to consider would be how to deal with it. It is important to see your doctor if your nails are clubbed or curved in order to be checked for an underlying medical problem. A physical exam, chest x-ray and blood work are common tests that your doctor may perform. If no problems are found, then there is no need for treatment. It is not uncommon for these types of nail issues to be present in people who do not have a health condition. Taking vitamin D3 and vitamin supplements for bone health have helped reduce the look of curved nails. For someone who has always had curved nails, it was noticed that the nails appeared to bend where they meet the palm when making a fist. Using several layers of polish and keeping them cut short has helped. Eating a lot of protein can help make nails straighter, such as eating three eggs in the morning, in case the cause is a protein deficiency. This can be better than using supplements because eating protein also fills you up. Biotin can help, especially when combined with vitamin D and calcium supplements for people who have weak, split nails. They can cause them to strengthen. It is also important to keep the cuticles pushed back and massaging the nails can also help.